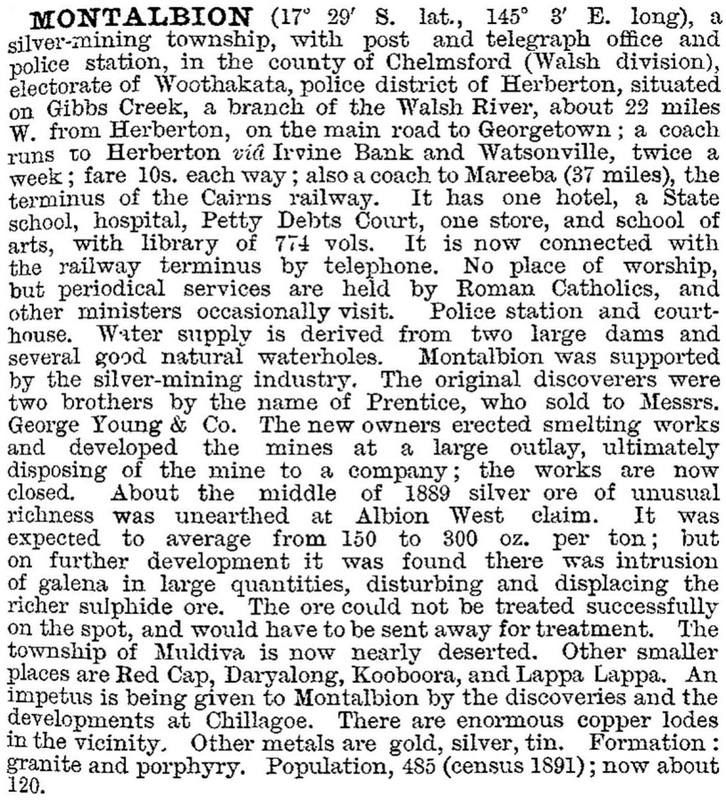 The Herberton Minerals Area, generally 20 km west of Herberton, had an active life between 1880 and 1930. Its four main towns were Irvinebank, Montalbion, Stannary Hills and Watsonville. Each of the last three towns at some time probably had a population of 500 people or more. Today Watsonville has numerous mine ruins, a cemetery and a fig tree marking the site of the primary school. 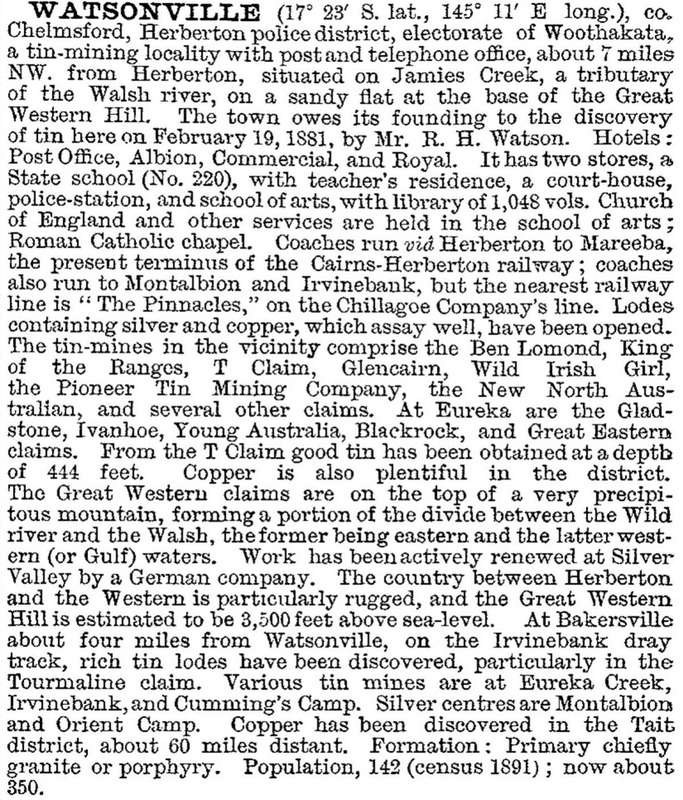 In 1883 discoveries occurred north and west of Irvinebank. To the north tin lodes were found on the headwaters of the Eureka Creek, and silver and tin lodes were found along Gibbs Creek to the west. The Eureka Creek site developed as the town of Stannery Hills (so named c1900 from the Latin 'Stannum', meaning tin). Reputedly Stannery Hills had a peak population of 800 people of whom half were employed in mining and woodcutting. The Post Office directory of 1906 recorded five hotels, seven stores (including one of the Jack and Newell chain), a post office and a station on the Irvinebank tramway. By 1924 numerous miners and two hotels continued, but ten years later only a few miners and the Federal Hotel were left. Moffatt centralised his activities in Irvinebank, which was connected to the Mareeba-Chillagoe rail line by a tramway, built in stages during 1902-07. The tramway ran via Stannery Hills, missing Montalbion and Watsonville. Its most important function was bringing in fuel for smelting; passengers travelled at their own risk, with spectacular gorges, horseshoe bends and tea and scones at Stannery Hills. The tramway ran until 1936, giving Stannery Hills a longer life than the other two towns.